The Virtues: Justice edited by Mark LeBar (Oxford University Press, 2018). The Evil Within: Why We Need Moral Philosophy by Diane Jeske (Oxford University Press, 2018). Jewish Philosophy in the Middle Ages: Science, Rationalism, and Religion by T.M. Rudavsky (Oxford University Press, 2018). Oxford Studies in Philosophy of Law, Volume 3 edited by John Gardner, Leslie Green & Brian Leiter (Oxford University Press, 2018). Law as Artifact edited by Luka Burazin, Kenneth Himma & Corrado Roversi (Oxford University Press, 2018). Phenomenology in France: A Philosophical and Theological Introduction by Steven DeLay (Routledge, 2019). Pleasure: A History edited by Lisa Shapiro (Oxford University Press, 2018). Planning, Time, and Self-Governance: Essays in Practical Rationality by Michael E. Bratman (Oxford University Press, 2018). The Evolution of Moral Progress: A Biocultural Theory by Allen Buchanan & Russell Powell (Oxford University Press, 2018). What is Philosophy For? by Mary Midgley (Bloomsbury Academic, 2018). Stoicism: A Very Short Introduction by Brad Inwood (Oxford University Press, 2018). How Fascism Works: The Politics of US and THEM by Jason Stanley (Random House, 2018). The Birth of Ethics: Reconstructing the Role and Nature of Morality by Philip Pettit, edited by Kinch Hoekstra with Michael Tomasello (Oxford University Press, 2018). I just nominated myself to serve on two APA committees: the Non-Academic Careers Committee and the Public Philosophy Committee. I would welcome your endorsement of my candidacy for either position when the election rolls around. What I would like to do is briefly introduce myself and my qualifications for these positions. PhD Philosophy 2018 from Fordham University. AOS Medieval Philosophy, Metaphysics. I’ve published papers in Synthese, the Journal of the APA, History of Philosophy Quarterly, and other reasonable, peer-reviewed venues. I have presented multiple papers on the main program of the APA. I continue to be an active researcher and publisher. I have held a number of paid positions as a philosopher: graduate teaching fellow, adjunct, postdoc. Pretty much everything except a tenure-track professor. I did a lot of that published research while teaching a 4/4 to make enough money to support my family while living in the Bronx. In June 2017, I decided to take a prestigious management training program with the Federal government. I’m currently a Management Analyst with the US Department of Agriculture. This program has given me an opportunity to build a diverse portfolio quite quickly. My duties have included a variety of data collection and analysis tasks, as well as operations research, software development, contract management, as well as budget formulation and execution. I also have some leadership experience in the non-profit through serving as a Precinct Chair with the Tarrant County Democratic Party in Texas. I have nominated myself for these positions because I believe the APA needs to focus its resources and efforts on promoting the goods of the discipline and its practitioners. That means working to articulate to the public as well as state and US lawmakers the importance of philosophy for our democracy. It also means working to help philosophers find careers that let them use their abilities for the public good while providing for themselves. That is why I have nominated myself for these two committees in particular. As a philosopher/civil servant I have practical experience using the knowledge, skills, and ability I cultivated as a researcher and writer to help leaders make impactful, data-driven decisions. Further, I will bring political savvy and at least some experience dealing with elected officials to the Public Philosophy Committee that will help the committee build bridges with state and Federal government. Further, as a ‘nobody' with an off-brand PhD who clawed and scratched his way through five years on the job market, I think I may be in a good position to help the Non-Academic Careers Committee create resources and disseminate information that will help job-seekers find rewarding, meaningful careers where their philosophical skills will be productive assets instead of just biographical curiosities. As a member of either committee I would work to orient that committee’s agenda around the good of discipline and the membership and push the association to keep those committees agendas at the top of its priorities. Allow me to mention one final qualification that I think is important. I have no personal or professional reason to curry favor with anyone at the APA. There is literally zero impact, good or bad, anyone associated with the APA could conceivably have on me, my family, or my career. Independence will allow my professional judgement to remain unclouded. Want to write a computer science paper? A quick reality check on the latest viciousness to come out of the mouth of the deranged monster-child. UPDATE: A statement from leading constitutional law scholars about this malevolent nonsense. A useful bit of humane reporting about migrants. I've been a long-time APA member and I have to say that my membership was an overall plus to my career. For example, a co-author was someone I just happened to meet in an elevator in Chicago, and we became life-long friends and collaborators. But I have to say that Mohan Matthen's comment: "Election would, of course, depend on name recognition." depressed me. I have been nominated on several occasions for committee work, and even self-nominated a couple of times. I never was selected of course, because, well, I'm a relative nobody. Still, I had some demonstrable chops, and wanted to contribute. But it didn't happen because I had no real "name recognition" in the profession. No way I want to get into the APA fray now though. But I think there are tons of great people--not with "name recognition" though--who could be solid contributors to correct the real plight that the APA is currently in. Effective participation in the workings of the APA should not be some sort of American Philosophical Idol contest, especially since they take every minion's money for dues and passage, but only allow "stars" to steer the ship. Perhaps mere nomination by name is not enough--maybe there should be a process not unlike hiring--with CVs and "serving statements"--that ought be reviewed and considered somehow--with a form of affirmative action for good people who aren't big names. Yes, more work for some people, but maybe also fairer representation for us nobodies. This is in no way a criticism of Professor Matthen, who simply described, alas correctly, the existing state of affairs. So let me encourage more "nobodies" to self-nominate and to reach out to me if you're on board with reforming the APA. Perhaps the "nobodies" might even be more focused on the crucial issues and core functions than the current leadership? The literature program — especially at the most prestigious universities — became a kind of twilight zone. No longer a discipline, it was an entire bizarro world, in which every aspect of human culture and thought could be confidently explained with the theoretical tools wielded by star professors. But when the students left the seminar room, the faculty office, the literary journal, that world ended, those stars winked out. I vividly remember my own rude awakening. Each year Johns Hopkins held a competition in which graduate students would submit ideas for a course. The courses would be evaluated by a board of professors from different fields, and the winner would get to teach it. I walked into the interview with my syllabus for a course that purported to explain urban decay, novels, the nature of free-market economics, and the political history of the 1970s in one brilliant synthesis. My interviewers — professors in political science and history — greeted my ideas with withering skepticism. I cited illustrious figures in my field. To my horror, my interlocutors were unimpressed. They actually asked difficult questions about the reasoning behind the stars’ dicta. All I could do was repeat the hallowed formulas about representation and language with decreasing confidence as I realized the heroes of literature-department economic, political, and historical thought had no currency here. Later one of my English professors advised me to forget the incident. "They don’t understand our discipline," he said. A propos this, Professor Kalef has expressed interest; would some APA members please nominate him for one or more position (nominees must then accept or decline a nomination). UPDATE: As philosopher Mohan Matthen (Toronto) points out, self-nomination is also permitted. So any folks who share some of the cooncerns about the APA we have been discussing should feel free to self-nominate and then reach out afterwards. 'Foundation for Excellence in Higher Education': what's the story? Judging from the faculty affiliates at several of these universities, it seems clear this Foundation has a right-wing and religious tilt. But beyond that superficial observation, I know nothing about it. Readers? The stuff that comes out of this piece of garbage's mouth would make Trump blush (or at least feel a bit embarrassed in front of Javanka). He is certainly on a continuum representative of the futile efforts of capitalist democracies to cope with the pathologies of economic life under capitalism, but he is not simply a rhetorical fascist. Good wishes to the people of Brazil! And for Americans, the key lesson is this: if the Democratic Party were actually to become a party representing the vast majority, and not simply the prudent wing of the ruling class, we can expect a similar phenomenon. ...at 3AM. An interesting interview; I agree with some things he says, disagree pretty strongly with some others. If someone is criticized for their public actions or speech, that is not "harassment": that is criticism. Examples of harassment would include, e.g., becoming the target of on-line mobbing by hundreds of philosophers; being targetted with verbal abuse, such as obscenities, sexual or sexist remarks, racist or other ethnic slurs, and other derogatory epithets; being framed for or falsely impliciated in wrongful or criminal acts; receiving death wishes ("I can't wait until you're dead") or threats of death or violence ("You better watch your back, we're gonna get you"). I have been harassed in all these ways, and others, and I am not alone in having been so harassed. To the other victims of actual harassment, my sympathies. To those confusing criticism with harassment: grow up! Criticism will continue. The APA Code of Conduct, with its violation of the academic freedom rights of faculty, was always an absurd document. But one might have thought at least those responsible for it would care about it. Apparently not! 2. Section V, on "Bullying [sic] and Harassment," purports to apply to conduct by APA members not simply towards colleagues and students but "others in the profession." This is specifically said to prohibit "any degrading, hostile, or offensive conduct or comment by a person towards another that the person knew or reasonably ought to have known would cause the target to be humiliated, intimidated, or otherwise gratuitously harmed. Typical examples of bullying and harassment include verbal aggression" and "calling someone conventionally derogatory names or using derogatory stereotypes to describe them." Obviously Professor Wilson is in plain violation of this provision of the Code. Professor Wilson, however, explained that she was not being hypocritical in her conduct because, "Truth-telling is not hypocritical." Now in the Code as written, there is clearly no exception for "truth-telling" via verbal aggressionn and the use of derogatory names and stereotypes. But for those originalists out there, please take note: according to one of the framers, none of these provisions apply when one takes onself to speak truthfully! Shall we hold our breath to see whether any officer of the APA deigns to condemn this violation of the Code by an APA member involved in drafting it? Of course not! Should scholars avoid citing the work of bad people (e.g., sexual harassers, anti-semites)? My latest Academic Ethics column at the Chronicle of Higher Education takes up the topic. Some examples, unsurprisingly, are drawn from philosophy, but the issue is arising in many fields. Justice Department defends anti-trans discrimination by businesses. Will this year *really* be a good job market for specialists in the post-Kantian Continental traditions? Last year was shaping up to be, but in the end several of the places advertising hired in other areas or didn't hire at all. (The excellent Samantha Matherne got some of the offers, and I was delighted an excellent student of mine also secured a tenure-track job--but overall, last year did not live up to promise for Continental candidates.) But a job seeker this year writes: "In glancing over this year's job ads, I get the impression that the trend continues to hold. By my count, there are jobs expressing serious interest in this area at Yale, UC Riverside (full prof.), Fordham, Boston College, Loyola Marymount, U. Mich/Dearborn, Vassar, McMaster, University College Dublin (4-year post-doc). Other ads voice interest in this area, even if they don't list it is as an AOS/AOC." Let's hope so. The last two centuries of philosophy in Continental Europe are easily the most important and relevant in the last five hundred. In the midst of all the diversity blather, we should remember that huge swaths of Western philosophy--the last two centuries of Continental European philosophy, not to mention medieval philosophy--are regularly ignored in Anglophone philosophy departments. Best journals for moral and political philosophy? Philosopher Peter Vallentyne (Missouri) suggested it might be worthwhile to once again run some reader polls on the best journals in vaarious areas. 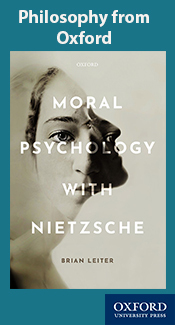 I'll start with the best journals for moral and political philosophy: this includes some generalist journals that regularly publish moral and/or political philosophy papers, as well as specialist journals. Rank order them based on the quality of the work they publish in moral and political philosophy. There are 34 choices; unfortunately, new choices can't be added once the poll has started, but hopefully there are no egregious omissions. Readers, where do you live? Readers, where (in what country) do you live? MOVING TO FRONT FROM YESTERDAY: Thanks to the more than 1100 readers who have already voted; if you've not yet participated, please do so! Thank you. ...at St. Joseph's College, University of Alberta. As they say, philosophy is about everything in principle! A propos our earlier discussion, philosopher Daniel Kaufman (Missouri State) has volunteered to be the point person for those interested in working on this. You can reach him at DanielKaufman-at-MissouriState-dot-edu. I'll of course post updates and information as things progress. Philosopher Nancy Cartwright (Durham/UC San Diego) discusses with a physicist as well as the owner of IAITV, Hilary Lawson, who really puts himself in far too many of these discussions with experts. As a longtime reader of your philosophy blog (10+ years) I wanted to write a note of thanks for your tireless coverage of these permanently furious, bloodthirsty dogmatists on the Left that give the rest of us (on the same side!) such a bad name. I referring to all this crap about diversity and New Infantilism and of course the nonsense on stilts regarding Tuvel and Stock. One wonders what bile these True Believers would produce if you *weren't* shining a light on these specimens of slave revolt! Despite my love for medical statistics, here is one situation where I am truly glad there is no control group! I suspect the item last week on Professor Trott's hypocrisy prompted this, but he raises a good question: namely, if someone were not shining a very public light on their misconduct, their hypocrisy, their mobbing, their attempts to suppress ideas and speech, would they be doing even worse? It's hard to imagine what that would be, but maybe vocal opposition does slow them down a bit. It is at least, as I know from much correspondence, helpful to the targets of the thought police to know they have much support. 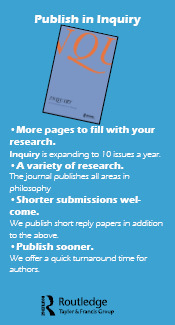 We are looking for qualified candidates to become managing editors of Ergo, an Open Access Journal of Philosophy, effective July 1, 2019. Ben Bradley (Syracuse) and Alastair Wilson (Birmingham) have generously volunteered to serve. We welcome applications that propose to complete this team, but also applications that propose their own, distinct team (e.g. for logistical or funding reasons). Given that the Twitter Red Guard continue to dissemble and moan about Professor Stock's and my expose of the APA blog scandal, perhaps a reality check is in order. Nathan Oseroff, a man in his late 20s, who has a prominent on-line position with the American Philosophical Association (that he continuously advertises), took it upon himself to launch a jihad against feminist philosophers, especially philosopher Kathleen Stock (Sussex) who held what he, in his superior wisdom, deemed to be a "morally unacceptable" opinion about the proposed gender self-ID law in the United Kingdom (this law would permit anyone to redesignate their gender for all legal purposes without any medical or other oversight, evaluation or waiting periods). This man used his role at the APA blog to post a comment attacking Prof. Stock on the APA's blog that violated blog guidelines (the editor in charge of the blog apologized to Prof. Stock, removed the comment and briefly suspended the offender--remarkably, he has not been removed entirely). This adult male also took to social media to defame Prof. Stock as someone who directed "hate" at her students and colleagues. Doing so would be grossly unprofessional conduct, but this man's only evidence for his libelous charge was that Prof. Stock had a different view about the gender self-ID Law in the UK than he did. In addition, it turns out that this man also abused his role at the APA to "police" the conference practices of a philosophy society that had actually accepted one of his papers, even though the APA, let alone its blog or its editors, has no authority about how professional societies referee papers. This adult man, who is almost 30 years old, objected that no one should criticize him since he is a PhD student in philosophy. Some of his fellow Twitteratti, endorsed this view (unsurprisingly, they are all similarly situated: adults in school engaged in stupid on-line conduct!). ADDENDUM: The last link no longer works, but Professor Stock caught a screen shot of this disgraceful performance by philosopher Rebecca Kukla (Georgetown). A discipline is an academic unit. It is neither a naturally occurring category nor an arbitrary relic of the history of higher learning. Rather, a discipline is an evolving body of skills, methods, and norms designed to explain parts of the world worth knowing something about. To recognize the importance of disciplines — to fight for their survival — is therefore to advocate for a picture of the world, an ontology. It is to insist that the world does not have a single order that is adequately captured by, for example, biology or physics or computation. A cliché sprung from the tech industry and business schools in the mid-’90s to describe how companies can appeal to neglected sectors of the market, "innovation" is now so ubiquitous in academic culture as almost to pass without notice. [Steven] Pinker pairs it however with a sibling piece of corporate jargon — "silo" — that is worth our attention. 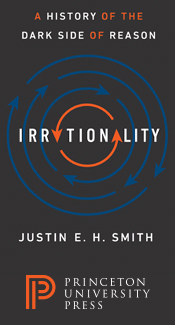 "If anything is naïve and simplistic," he writes, "it is the conviction that the legacy silos of academia should be fortified and that we should be forever content with current ways of making sense of the world." Surely many readers of this essay have at some point heard a dean or outside consulting agency decry faculty lodged in silos, or departments siloed in tepid irrelevance, each split off from the other. The history of this pejorative and its migration into the lexicon of university administration tells a fascinating story. I put "harassment" in quotes for the obvious reason: Trott conflates actual harassment, such as death threats, with on-line "trolling" and no doubt any criticism, at least of her friends and tastes. Her essay really isn't about harassment, but another tired attempt to whitewash suppression of the views she doesn't like--hence this bit of self-serving blather: "Only such community projects [like the APA Blog!] can resist posts that draw in traffic and do real [sic] harm by discussing experiences and identities of marginalized groups in philosophically abstract and distant tones as if people’s lives are puzzles." In her world, the 'harassment' of Professor Tuvel is, no doubt, a model of good community behavior! Can't wait to hear all the established philosophers say they stand with @AdrielTrott after she was harassed by a philosopher after she gave a talk about harassment in philosophy. I'm sure some "established philosophers" do stand with Trott's shameless hypocrisy, no doubt because they share in it.